Product code: W721 Categories: Sold Items, Sold Watches. The Cartier Tank watch has remained a classic since its launch in 1917, and here is a very stylish and classic looking automatic Cartier Tank Francais reference 2302. With the stainless steel case measuring 28mm across plus the cabochon sapphire crown, this watch case is deceptive as it appears larger on the wrist and would suit a man or a woman and always look so stylish day or night. With the traditional and elegant Roman numerals, there is the date window at the bottom as well as the sweep seconds for that extra touch. Inside is a Cartier automatic movement that has just been serviced and comes with our twelve month warranty and no matter where or when this watch is worn, will continue to remain so elegant and stylish. 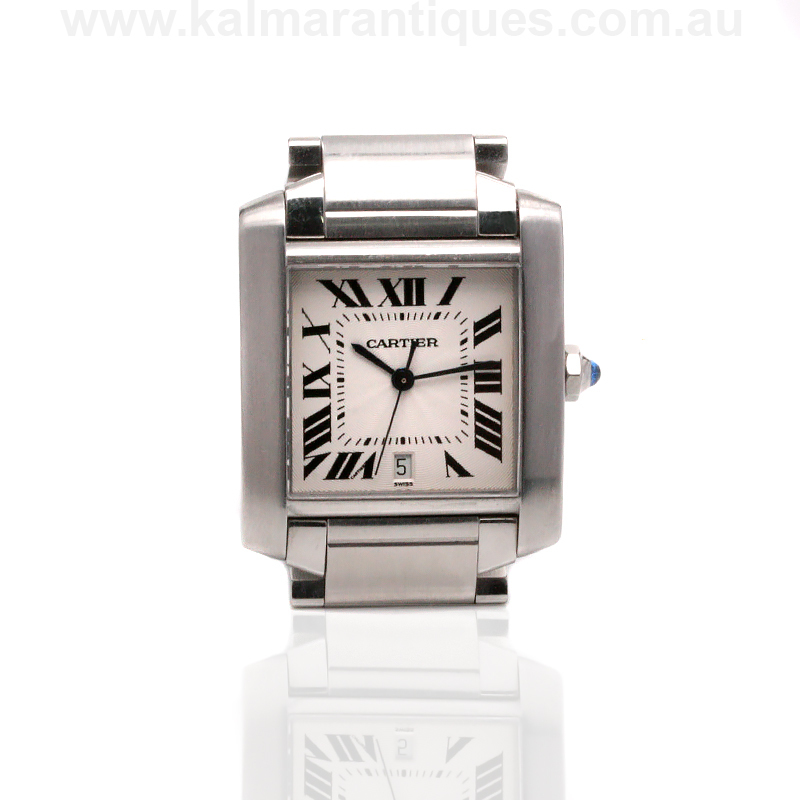 A great looking Cartier Tank Francais for any occasion. Brief history on the Cartier Tank watch. The Cartier Tank watch was created by Louis Cartier in 1917, and was actually inspired by the army tanks that were first used in World War One. First introduced in 1918, the Cartier Tank watch has been such an easily distinguishable model thanks to its clean straight lines, somewhat mimicking an army tank. 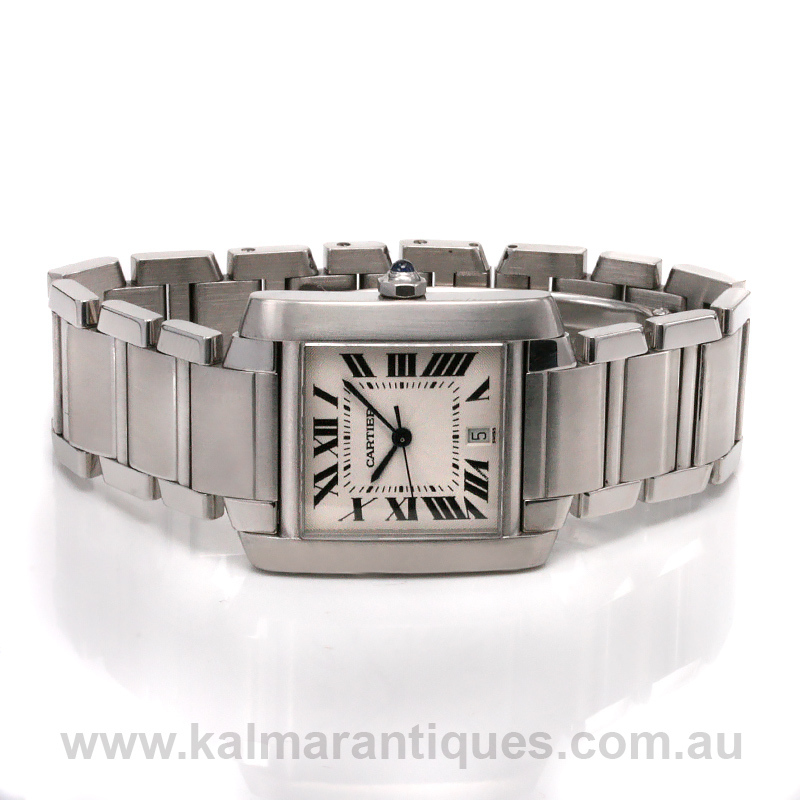 Variations of the Cartier Tank have been produced including the Tank Louis in 1922, the Tank Americaine in 1989, and the Tank Francaise in 1996.